We are re-posting this message as a reminder that it is time to order your freshly roasted coffee! The order deadline is coming up fast. Please send us an e-mail by Sunday, October 21st. Tim Rask will work his roasting magic mid-week, and we will have freshly roasted coffee ready for you on Saturday, October 27th or Monday, October 29th. Pick it up in Friendswood or Richmond! October is Coffee and Muffin Time!! 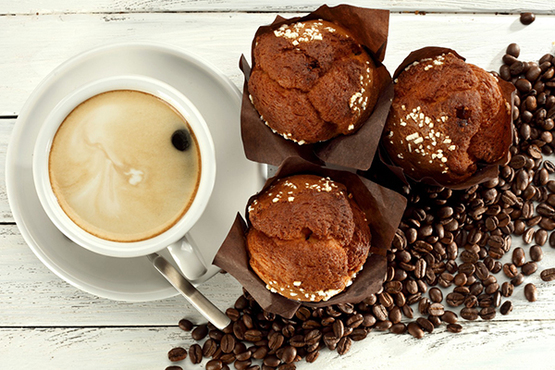 October means pumpkins, and pumpkins mean muffins, and muffins mean coffee! At Bethlehem Harvest we are ready to fix you up with both. First, we will take a look at this month’s coffee selections, and then we will delight you with a recipe for Abigail Rask’s delicious Pumpkin Oat Muffins. Keep reading! You don’t want to miss a thing! Bethlehem Harvest is delighted to offer our customers some of the very best coffee available on the world market. Our coffee selections are personally purchased and roasted by, Tim Rask, a Licensed International Coffee Quality Grader (Q-Grader). The coffee is roasted and packaged just prior to our distribution date, so our customers can enjoy some of the freshest coffee available anywhere. This month we are proud to offer another truly outstanding coffee from Kenya which features flavors of citrus, blueberry and brown sugar. Peaberries are smaller beans which are sweeter and more densely packed with natural sugars than larger beans. This Kenyan Peaberry packs a sweet punch that will wake you up and lift your spirits! Roasted almond, cinnamon, cocoa and caramel flavors feature prominently in this sweet and well-balanced coffee from Guatemala. This decaf from Honduras presents flavors of chocolate malted barley, cardamom and almond. Enjoy a cup after dinner and then get a good night’s sleep! To place an order for your freshly roasted coffee, please drop an e-mail to bethlehemharvest@gmail.com by Sunday, October 21st. We will have it roasted and ready for pick up in either Friendswood or Richmond on Saturday, October 27th. And since there are not many things better than a fresh pumpkin muffin to go with your cup of coffee, below you will find a recipe from Abigail Rask, who loves all things pumpkin and all things coffee – especially side by side! We are looking forward to serving your family whether your greatest interest is coffee or muffins! If you have any questions, please feel free to drop us an note at bethlehemharvest@gmail.com or call/text us at 281-797-8932. Mix wet and dry ingredients together until just moistened. Spray twelve muffin tin cups with Vegalene Non-GMO spray. Fill each cup 2/3-3/4 full. This entry was posted in Freshly Roasted Coffee, Grains and Supplies and tagged Coffee for home brewing, Discount prices for bulk coffee, Fresh Roasted Coffee, Gourmet coffee by the pound, Gourmet coffee houston by Gail DeGray. Bookmark the permalink.